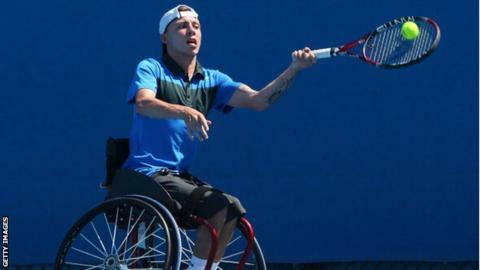 Great Britain's Andrew Lapthorne and Lucy Shuker both lost their wheelchair singles matches at Melbourne Park. But Lapthorne has a chance of qualifying for the final despite his 7-5 1-6 6-4 defeat by top seed David Wagner in their round robin match. Shuker, ranked seventh in the world, lost 7-6 (7-1) 7-5 in the semi-finals to Germany's Sabine Ellerbrock. The 32-year-old and her partner Marjolein Buis did progress to the finals of the women's doubles. Shuker and her Dutch team-mate beat Ellerbrock and Sharon Walraven of the Netherlands 7-5 6-3. Lapthorne, who won Paralympic doubles silver with Peter Norfolk in London, beat American Nick Taylor 7-6 (7-5) 6-2 in the first of his round-robin quad singles matches and will next play Sweden's Anders Hard.